Why did Yeshua teach in parables? Why didn’t he just use plain language to explain what he wanted to say? Why did he have to use so many stories that seem so cryptic and puzzling? Did he want his listeners to understand his message, or was he masking his teachings with layers of coded symbolism that he only explained to his closest disciples? Was he hiding secret truths from the masses as the Gnostics believed? For example, the Gnostic work called the Apocryphon of John opens with the claim to be “The teaching of the savior, and the revelation of the mysteries and the things hidden in silence, even these things which he taught John, his disciple.” Did Yeshua teach Gnosticism? As opposed to the biblical concept of faith—trust combined with faithfulness—the primary tenet of Gnosticism is belief or knowledge (gnosis). At times, the Gospels seem to support this perspective. Matthew records Yeshua telling his disciples, “To you it has been given to know the secrets of the kingdom of heaven, but to them it has not been given.” Just a few verses further Matthew says the reason Yeshua speaks in parables is to fulfill the prophecy which says, “I will open my mouth in parables; I will utter what has been hidden since the foundation of the world” (v.35). But is this the proper way to understand Yeshua’s teachings? In order to answer our original question—Why did Yeshua teach in parables?—we must first understand the nature parables. Most of the time Yeshua’s parabolic teachings are misunderstood simply because we misunderstand parables and their function. Many times we treat Yeshua’s parables like allegories, trying to find one-for-one symbolic meaning in each of the elements of the parable. This method of interpretation was made popular in the second century by Origen, an early church father from Alexandria, Egypt. Parables explained the deeper teachings of Torah in practical terms. The sages considered parables to be the “handles” for the Torah (Eruvin 21b). They clarified the Torah teaching of a rabbi and made it practical. The parable begins by taking the listener from their current understanding into a thought-provoking world in which the character and nature of God is revealed. Parables take abstract and spiritual values of the Torah and communicate them in tangible ways. They played a critical role in the transferring of Torah learning from rabbi to disciple. The midrash teaches that a person can master the words of Torah through his understanding of parables. If we were to rephrase this, the author of the book of Matthew is saying the reason Yeshua speaks in parables is to reveal and clarify concepts which have been historically misunderstood. These are the “handles for the Torah” that the sages speak of. When Yeshua’s disciples previously asked him why he spoke in parables, it might be similar to the modern listener hearing a teacher continually using children’s stories to illustrate his points, one by one. Yeshua didn’t teaching in parables in order to hide secret knowledge, but to make his teachings perfectly clear to anyone who was listening. Comparatively, parables were the flannel graphs or the graphic novels of the first century. If you didn’t understand what the teacher was saying, it was your own fault. He had clarified it to the point that a child could understand it. Why do we misunderstand Yeshua’s parables? Because we are removed from the cultural context by two thousand years, multiple languages, and a completely different religious paradigm. Why did Yeshua teach in parables? 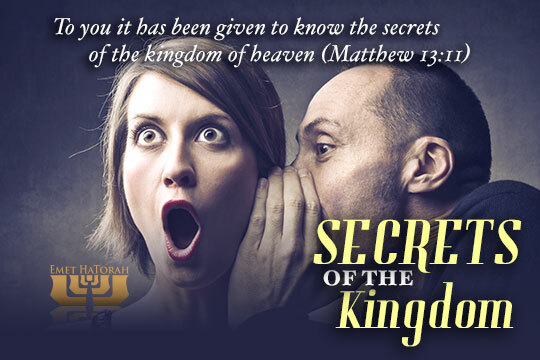 To reveal the secrets of the Kingdom of Heaven, of course—the proper understanding of Torah and its practical application. Are we taking advantage of those secrets, or has our gnosis blinded us from seeing what has been hidden in plain sight for two thousand years?